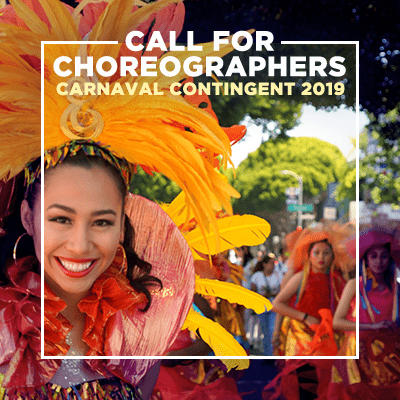 MCCLA is seeking proposals from experienced choreographers with demonstrated teaching skills to create a thematic Carnaval choreography, and to teach that choreography to classes of adults and children of all skill levels. Proposal’s theme and concept should relate to Carnaval San Francisco’s 2019 theme, Culture Heals. Applicant can suggest the theme for the contingent, but final decision will be made by MCCLA’s Carnaval Committee. MCCLA usually participates in the Caribbean, Traditional/Folkloric, or Contemporary categories, with at least 2-3 different rhythms. 1. What is your proposed theme and concept for MCCLA’s 2019 contingent? 2. How will your proposed theme/concept incorporate the elements of dance, music, costume, and overall contingent movement and visual impact? 3. What type of dance category and music rhythms are you considering in your proposed choreography? Proposals, resumes, and inquiries must be emailed to info@missionculturalcenter.org by December 5, 2018 at 5:00pm. • Proven choreography, artistic vision, and experienced teaching skills. Carnaval experience preferred, but not required. • Ability to effectively work in a team with a mature and respectful manner and relate to participants of all ages and skill levels. Exhibit flexibility and generate enthusiasm. Have a sense of humor and positive attitude for duration of project. • Sun May 26th: Carnaval Grand Parade! Carnaval San Francisco is the largest annual cultural event in the City. It’s a unique multi-cultural event celebrating traditions of many countries and cultures around the world. Carnaval started in the Mission District in the mid 1980’s and has become one of the highlights of the neighborhood. The 2-day festival and parade bring thousands of visitors to the Mission, and over 60 comparsas (contingents) participate in this cultural and artistic display of diversity and color; the Carnaval Parade. MCCLA has been a proud Carnaval SF participant since its early beginnings (40 years ago) promoting multicultural arts and traditions.